Overall Print Size: 25" x 20 1/2"
The 19th of August 1942 will be remembered as the date of the ill-fated "reconnaissance-in-force", known as "Operation Jubilee" - the joint British-Canadian amphibious assault against German troops on the French coast at the harbor of Dieppe. Air cover was provided by the greatest armada of RAF aircraft assembled for battle up until that time. That day has been described as an almost continuous melee of close aerial combat; aircraft of both sides spiraling towards the sea; planes colliding in mid-air; ships burning and sinking in the harbor and along the channel coast with a pall of smoke covering the entire scene below. Among the many RAF Fighter Command units flying that day were three "Eagle" squadrons made up of American airmen flying MK VB Spitfires. Despite heavy allied losses, the Americans carried out their mission exceptionally well. They were credited with 10 enemy aircraft destroyed, 5 "probable," and 12 damaged. 133 Eagle Squadron was led by Flight Lieutenant Donald J. M. Blakeslee, who alone was credited with shooting down one FW190 and one DO217, as well as two FW190 "probable" in a gallant attempt to protect the allied troops below. Blakeslee also had the distinction of being the only "Eagle" commanding officer to complete all four missions on that day. "FOURTH MISSION OF THE DAY" transports us back in time to the 133 Eagle Squadron's forward airbase at Lympne, England. 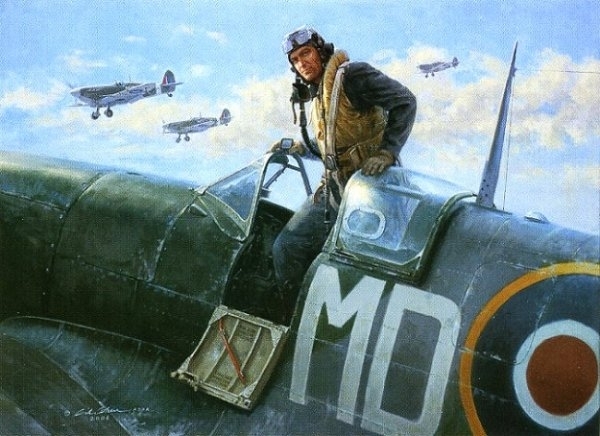 Don Blakeslee is climbing out of the cockpit of his Spitfire after completing his 4th sortie on this long and harrowing day. On his face we can observe the countenance of lines of exhaustion, mirroring a protracted day of deadly combat. In the background other "Eagles" are coming in to land. The following month in ceremonies at the Debden fighter base, the three RAF Eagle squadrons were transformed into the newly formed 4th Fighter Group of the US Army Eighth Air Force. Later, under the inspiring command of Colonel Don Blakeslee, the 4th Fighter Group went on to achieve great fame for the number of missions successfully completed, enemy aircraft destroyed, and unit citations received.